Historically ethnic Somali inhabited territory in East Africa roughly corresponding to Greater Somalia. 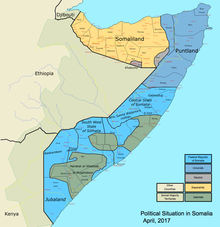 Greater Somalia (Somali: Soomaaliweyn, Arabic: الصومال الكبير‎) comprises the regions in or near the Horn of Africa in which ethnic Somalis live and have historically inhabited. The territory historically encompassed British Somaliland, Italian Somaliland, French Somaliland, the Ogaden in the Ethiopian Empire and the Northern Frontier District in the Colony and Protectorate of Kenya. At the present day, it encompasses Somalia (which includes the self-declared region, Somaliland and the semi-autonomous region, Puntland), eastern Djibouti, the Somali region and Dire Dawa in Ethiopia, and the Lamu, Garissa, Wajir and Mandera Counties (all except Lamu formed part of the former North Eastern Province, which was abolished in 2013) in Kenya. In early World War II, Italian troops invaded British Somaliland and ejected the British. Benito Mussolini annexed the conquered area to the Italian Somalia and added even the area of Moyale and Buna near the Jubaland in eastern Kenya. In August 1940 Mussolini boasted to a group of Somalis in Rome that with the conquest of British Somalia (that he annexed to Italian Somalia) nearly all the Somali people were united, fulfilling their dream of a union of all Somalis. In September 1940 he even announced to the Somali people in Italy of having created an Italian Grande Somalia inside his Italian Empire. Indeed, in early World War II, Italian troops invaded British Somaliland and ejected the British. 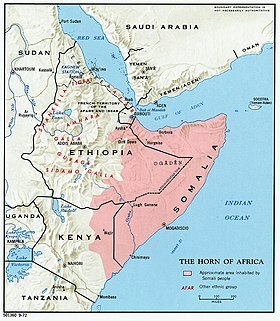 However, Britain retained administration of most of the almost exclusively Somali-inhabited Northern Frontier District. Italians even did a tentative to occupy French Somaliland in summer 1940. Between 1977-1978, Somalia and Ethiopia waged a war over control of the predominantly Somali Ogaden region. 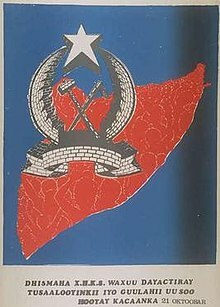 In 1978 and with the help of Soviet and Cuban troops, Ethiopian troops drove back the Somali army from the Ogaden, effectively marking the end of the Ogaden War. ^ Gebru Tareke, Ethiopia: Power and Protest: Peasant Revolts in the Twentieth Century. Cambridge: Cambridge Press, 1991. ^ The details of this paragraph are based on Paul B. Henze Layers of Time: A History of Ethiopia (New York: Palgrave, 2000), pp. 263f. ^ de Montclos, Marc-Antoine Perouse (June 2008). "Humanitarian Aid, War, Exodus, and Reconstruction of Identities: A Case Study of Somali "Minority Refugees" in Kenya". Nationalism & Ethnic Politics. London: Taylor & Francis Ltd. 14 (2): 289–321. doi:10.1080/13537110802034985. ISSN 1557-2986. ^ "Islamic Leader Urges Greater Somalia". Associated Press. 2006-11-18. Retrieved 2007-01-15.